Today is Enough for me, today! Today, I Will Keep Love on top of all I do, say and think. Today, I Will remember that God has Already given me the Grace I need to trust Her More. Today I Will remember that I need to be completely in sync with God's Holy Spirit, and to allow correction where I am not completely in sync with God's Holy Spirit. Today, I will remember that God sent forth Change into my life, and I will surrender to all Changes that God deems necessary to better my life. Today, I will remember that I am Already within several New Beginnings, whether I see or know the details, I Know I am within them. Today, I know not to offer More than I can deliver. Today, I know to pay attention to the lack and weaknesses of others so that I am not expecting from them, what they cannot give. Today, I know not to allow the lack and weaknesses of others, nor my own to stop me from doing my part, because God will step into all lack and weaknesses in order to complete what God wants completed. Today, I will remember that I know how to walk on water, I know how to float on the Holy Spirit as He goes where He knows best, and I know when to get out of the water. Today, I will not allow the immaturity of others to alter my course! Today, I will remember that all others will not be for me, even if they work with me. I know that God is always with me, no matter who is not doing their part, I will do my part effectively. Today, I will remember that God will call on me to do for those who cannot return the same. Today, I will remember to Ask the Holy Spirit for clarity when I am not sure if God is sending me, or if I am sending me. Today, I will remember that I am given many opportunities to draw closer to God, and I will take them all! Today, I will remember that I have needs also, and that many around me may not be able to tend to my needs, so it is up to me to take care of myself--which means to keep myself in God's Hands. Today, I will remember that speaking 'No' with courage and strength, is a Gift. Today, I will remember that when I Speak 'NO', the reaction of others is not my issue, and has no bearing on my work and life. Today, I focus on the Power of God's Love & Promises so that my Faith and Trust in my Lord, have complete freedom to grow and mature. Today, I will remember to allow the Lord to met my needs because I left them all with God to take care of. Today, I will remember to cover all with the Love that God has poured into me, because my Calling is Bigger than I am. Today, I Will remember that I am Growing and Maturing to Fit into my Calling. 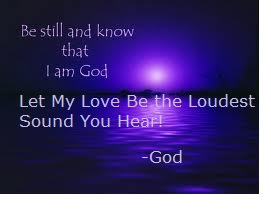 Today, I will remember to Listen for the Sound of God's Love, all other sounds are simply noise and have no way to Help me serve the Lord today! Thank You Mother God In the Name of Jesus, for saving me from myself, and guiding me along the Path That You have already created for my life for Today! I Pray I serve You Well and that You will correct all that is Not aligned with Your Will and Plans. To You my God in the name of Jesus Be all the glory and honor from my life for today and ever more, So Be It! The Holy Spirit knows exactly when it's time to deal with things in your/my life. "The Advocate, the Holy Spirit, whom the Father will send in My name, will teach you all things and will remind you of everything I have said to you."